TECHNICALLY, the longest day of the year fell on June 21, but try telling that to Yorkshire’s bowlers. For them, June 22 must have felt even more drawn-out as they were put to the sword at the Riverside yesterday. All the talk going into day three was whether Yorkshire would win in three days or four. But that talk had changed come close of play, with Yorkshire by no means guaranteed victory at all. The biggest question to be decided as the nation goes to the polls today is not whether Britain should leave the European Union. For all Yorkshire cricket lovers, it is the much more pressing question as to whether the champions can overhaul a Durham lead that presently stands at 301 with two wickets remaining. Durham will resume on 452-8 in their second innings after Keaton Jennings, the South African-born opening batsman, and Usman Arshad, the Bradford-born all-rounder, both made career-best scores. Jennings anchored the resistance with an unbeaten 185, and Arshad contributed an aggressive 84, the pair adding 156 for the seventh-wicket in 36 overs. It promises to be an intriguing climax in the north-east, where Yorkshire knocked off 336 to win with four wickets to spare in 2013, the fourth-highest successful chase in their history. However, they had a significant trump card on that occasion in the form of current England vice-captain Joe Root, who scored 182 in arguably his finest innings for the club. Root is not playing here, one of five Yorkshire players on one-day international duty with England against Sri Lanka. So if Yorkshire are to mark the centenary of the birth of one of their greatest players today, if not the greatest, in the shape of Len Hutton, they will need others to step up and produce an innings of which the great man himself might have been proud. Yorkshire, of course, are entirely capable of doing just that; their top-four includes New Zealand captain Kane Williamson, along with Adam Lyth and Gary Ballance, both of whom played Test cricket as recently as last year. But they will have to perform better with the bat than they did with the ball yesterday, when a combination of an easing pitch and a greenhorn attack provided the conditions in which Durham turned the game on its head. The hosts had gone into the day on 98-3, trailing by 53, and although it was always likely to be much tougher for Yorkshire second time round after they dismissed Durham for 172, few expected it to be quite so tough. Yorkshire’s position was strengthened when Durham gifted them their fourth wicket. Michael Richardson deflected the ball out to square-leg and was called through for a single, only for a direct hit from debutant Ben Coad to run him out. Jennings, whose call it was, appeared to use the mix-up as impetus as he started to stamp his authority on events. 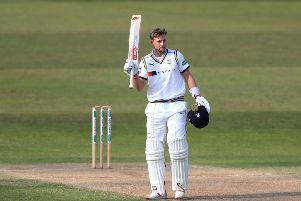 Having failed to add to his overnight 46 in the first 35 minutes of play, Jennings reached his half-century from 136 balls with six fours and found a willing ally in Paul Collingwood (61), the pair adding 117 in 36 overs in a fifth-wicket stand that left Durham 71 ahead. Collingwood, who reached fifty from 93 balls with seven fours, looked fortunate to survive an lbw appeal from Steve Patterson, but he was subsequently pinned by Williamson, one of three off-spinners called on in addition to Lyth and Jack Leaning. Jennings was almost run-out in reaching his hundred with a three off Tim Bresnan, who whipped off the bails after some smart work from Leaning on the cover boundary. It was Jennings’s fourth century already in this year’s tournament, and a mighty impressive one too. Bresnan bowled Ryan Pringle playing back, and Coad was denied a maiden first-class wicket when Lees dropped Arshad on 33 to his left at first slip. But Coad later got his man caught behind to a tired off-side waft, with Arshad – a product of Beckfoot Grammar School in Bingley – falling short of a maiden hundred. Patterson had Barry McCarthy caught behind, but Jennings ploughed on and on. For Yorkshire, it was a day that felt as though it would never end.